It takes emotional strength to get through those moments when Manya becomes very negative and enraged, even spitting at me, or others. In 1941 my father died suddenly of a heart attack at age 59. At the time I wrote a short poem that I entitled “Sad and Alone.” Actually it was a song but since I cannot write music I am the only one who knows the melody. Unfortunately over the past 12 years she has succumbed to the ravages of Alzheimer’s. In our early years together we had the usual bumps in the road that every married couple faces, but basically they were beautiful and exciting times. We managed to visit almost every state in the country, and traveled abroad from China to Israel and many countries in between. Yet it is unbelievably sad to watch Manya these days when she may smile and kiss me one moment, as she did today when I returned from my morning walk, and the next minute refer to me as her father, or worse, ignore me completely. We all laughed outwardly, but I was crying inside. I feel so uncomfortable these days going for a walk with friends, or just going to the library, knowing that she is alone in her own little world with strangers to watch over her. The worst part are those times when she doesn’t even know who I am nor recognize our children or grandchildren. And, even worse, there is no hope. On that note, the good news is, Manya is often in a happy mood, greets most people with a smile, strangers or not, and most of the time she does not appear to be suffering. Once she falls asleep, I have several hours to relax and watch a movie or read, and in the mornings when the aides arrive I go for my daily walk at the local mall with friends. Once or twice a week, I am still able to take Manya out to dinner with friends, where the Maitre d’ and the staff all know her. She is still able to feed herself, albeit very slowly as she examines every morsel of food, often taking an hour or more to get through a small meal. Lately, after observing her almost choke a few times, I’ve had to switch her over primarily to soup, yogurt, baby food and ice cream—things that are tasty and easy to get down. But she still eats her chocolate wafer cookie! I do find it extremely agitating when she refuses to eat at all, or just plays with her food, moving it around the plate with her fork, never taking a bite. That might be what continues to frustrate me the most of all. But I’ve learned to use plain bowls rather than dishes with designs that distract her. I’ve finally stopped trying to understand why Manya’s mood can change so abruptly, like yesterday when she threw a strawberry at me in anger at breakfast, or when she decides to spill a glass of juice all over the kitchen table. Minor transgressions, when you consider that they pass as quickly as they came, and she usually laughs afterwards, while I’m cursing under my breath and cleaning up the mess! 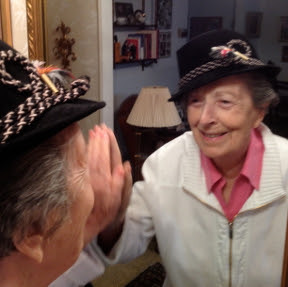 We all need to recognize that our loved ones with Alzheimer’s do not know what they are saying or doing at such times, and we need to be appreciative of and thankful for those intervals, momentary though they may be, when they are kind, happy, and loving. I’ve also learned to recognize that sometimes her sudden bursts of anger are her way of expressing that something is physically bothering her, much like an infant crying in the night to be changed. Thankfully, Manya has mostly been in excellent health throughout this ordeal. Which is ironic, given that our family physician of 40 years essentially gave up on her four years ago and sent hospice over to the house. They concluded within minutes of meeting her that she was in no way ready or qualified to receive hospice care! I found a new physician after that incident. Meanwhile, the aides take her out for walks around the neighborhood once or twice a day to keep her strong, and we manage to get her to drink a bottle of Ensure once a day. And there is very rarely a time that I cannot at least interest her in a bowl of vanilla ice cream with Redi-Whip! Or a piece of milk chocolate. So I pray that my family and friends will continue to give me the moral support and strength that I need to continue as long as possible to give Manya the love and attention that she needs during these difficult times. I feel that I am doing what I am doing for her sake, and for our children and grandchildren, and our new great-grandchild! Now I’m ready to go to sleep, and pray, as I do every night, that God will continue to give me the physical and emotional strength to take care of her, and my last thoughts will be…will she be smiling or not when she wakes up in the morning? Will tomorrow be one of those “better days” that Curly assured me were coming as the German shells came at us during the Battle of the Bulge back in 1944? Max A. Sobel is a former professor of mathematics at Montclair State University, and a widely acclaimed author of over 60 math textbooks. He and his wife Manya will both turn 90 in the next six months, and have lived in Fair Lawn, New Jersey for over 60 years. 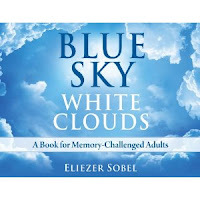 They are the parents of Eliezer Sobel, author of Blue Sky, White Clouds: A Book for Memory-Challenged Adults, inspired by and dedicated to Manya.